Driving Around Mario Kart Style in Japan: Fun or Not Fun? While in Osaka, I ended up going on the Mario Kart Osaka tour. I picked up an International Driver’s Permit just to do this tour. It did come in handy though since [I needed to rent a car for a week in Okinawa]. The short answer is, it’s fun for like 10 minutes. Don’t be fooled by the high reviews, they give you a discount for a good review! Customers for the Mario Kart experience in Japan (they have them in all the big cities) are incentivized to give reviews. So you’ll see a lot of good reviews for an experience that I found subpar. To make the booking, you go to their website and fill out a form or you can contact them via the Line app. I went with Line since that was much easier. They were quick to respond and had plenty of availability for our booking made on short notice. The cost was the same for day and night, so we picked night since it worked out better with our schedules. A big bonus to choosing night was that there was less traffic and we were able to move around faster. Google Maps somehow screwed us on the directions. We got there, but to the backside of the building where there was no entrance. The garage is located one street down off the main road. If Google Maps tells you otherwise, it’s lying to you. It’s really frustrating when that happens since you have to take the time to walk around and that this was the 3rd time Google did that to me in 2 weeks. Once you arrive at the garage, you check-in with one of the workers and start filling out the paperwork. For non-Japanese residents, you’ll need to provide your passport and International Driver’s Permit. After that’s done, feel free to pick a costume. I went with the Goku tracksuit! It was SUPER comfortable and I want to buy one to use at the gym. 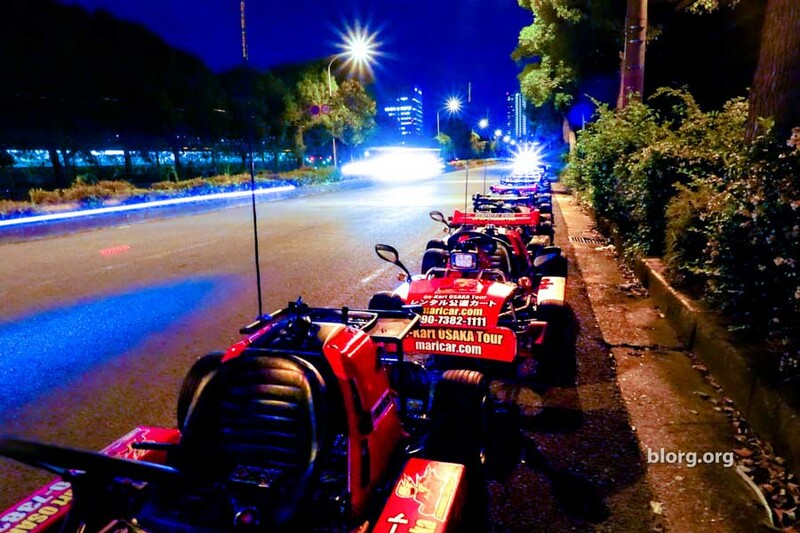 You’ll start with a breakdown of how the kart works then the road signals to follow from the guide. If you’re coming from a country that drives on the right side of the road (ex: USA), it will be a little challenging to switch to the left side. I recently rented a car for a week in Okinawa so I was already used to the experience. After that, you start your journey. When you’re driving around in a go kart with actual cars, it’s pretty scary cause you’re not sure if they see you. I ran into a situation where a car merged in front of me and it split up our group. With some quick driving skills, I got to cut loose and go full speed to catch up. Full speed is 50km/h but it’s much scarier when you’re that close to the ground, the kart is shaking like crazy and you’re not wearing a helmet. We took the tour in October 2017 and in Osaka, the nights were pretty cold. Driving go karts fast without gloves on made my hands extremely cold. Additionally, when you’re driving behind a go kart you’re going to get hit in the face with smog. The facility told us to bring out passport and IDP, but didn’t tell us to bring gloves and a face mask. Business tip: Sell gloves and face masks! Or at least rent something out. That would add income and improve people’s experience. The tour involved a lot of photo ops and very little tourism. I’ve done lots of tours all over the world and enjoy them because I get a sense of the culture and history from a city. Mario Kart Osaka provided no culture and history. The biggest stop we took was at a restroom for a potty break and a government building for poorly lit photos. We BRIEFLY stopped at Osaka castle but weren’t provided any time to get out of the car and look around. As far as actual tour go, you’ll be happier just renting the kart for 20 minutes to drive around the city while going elsewhere for a real tour. To get 2000JPY back for the tour, all we had to do was like their page on Facebook and leave them a review. I left them a 5-star review but later updated it to 2 stars with points I laid out in this post. I like the idea of the tour, but they still have a lot they can improve on.